Save Energy. Save Money. The Easy Way! There are few feelings better than fine-tuning your air conditioner to maximize its efficiency, keeping your home at that perfect temperature, and saving you as much money as possible on your electric bill, but even if your system is working exactly as intended, there is still one more way to cut down significantly on your energy bills. 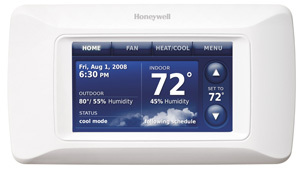 Programmable thermostats can be custom-programmed to meet your needs and your schedule. During hot, humid summer months it will raise the temperature when you’re away from home, using less power when it isn’t inconvenient for you, and then automatically lowers the temperature when you are heading back home so that your home is cool and comfortable when you return. With this particular model, it uses the location services on your smartphone to detect when you’re leaving the house and automatically switches to an energy saving mode. Our Houston HVAC technicians have been specially trained on the installation and upkeep of programmable thermostats. They can install your new thermostat, teach you how to program it and even show you other ways your thermostat can keep you comfortable while saving you money. With all the money it saves. This thermostat is even Alexa and Apple Homekit compatible, allowing you to change the temperature of your home with a simple voice command. These thermostats also monitor the air quality and pollen levels in your local area and automatically activates your A/C fan to clean your home’s air (which is up to ten times more polluted than the air outside!). The thermostat automatically sends you email updates whenever it detects a need for service or maintenance. If you want to know how well your A/C is your system’s performance thermostat provides data on your systems performance history, temperature ranges, and how much time the system runs for each day. You can even adjust the frequency at which you receive these reports. Start saving energy and money the easy way! Have a Village Plumbing & Air HVAC technician install a programmable thermostat today!